Sole and flounder are both flatfish found at the bottom of the ocean. While they are two different types of fish, both sole and flounder taste the same and have the same nutritional make up. In either case, you can't go wrong by including one of these fish in your diet. In fact, the 2010 dietary guidelines for Americans recommends you eat 8 ounces of fish a week to lower your risk of heart disease. Knowing the nutritional data for flounder and sole can help you see their nutritional benefits. A 3.5 ounce, or 100 gram, cooked portion of either sole or flounder has 117 calories. With just 1.2 calories per gram, sole and flounder are low-energy dense foods, which means they have few calories compared to their weight. Including more low-energy dense foods in your diet helps you feel full on fewer calories, which might make it easier for you to manage your weight. 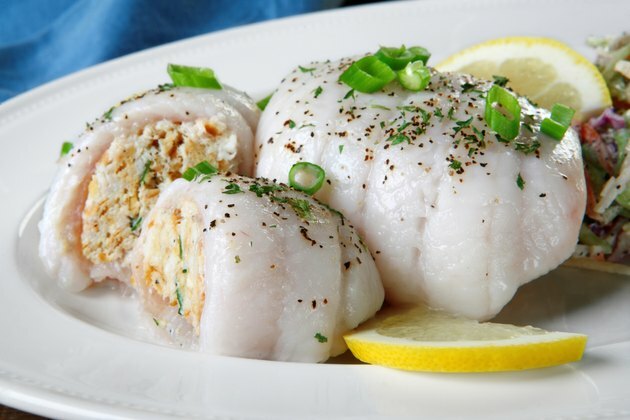 Sole and flounder are very low in fat, with 1.5 grams of total fat per 3.5-ounce serving. While fat in food is a good source of calories, and helps you absorb fat-soluble vitamins, getting too much fat in your diet increases your risk of heart disease. In addition to being a very low-fat protein food, sole and flounder are also very low in saturated fat, with 0.4 grams per 3.5-ounce serving. Saturated fat in food raises blood-cholesterol levels, and the U.S. Department of Agriculture recommends that less than 10 percent of your calories should come from saturated fat. Sole and flounder are good sources of B vitamins, magnesium and phosphorus. You need B vitamins to help turn the food you eat into energy. B vitamins are also necessary for the production of red blood cells. Magnesium is a mineral that also helps in energy production, and is also needed to make protein and aid in blood sugar and blood pressure control. Phosphorus is important for healthy teeth and bones.